If music could materialize, then the sound that engulfed the Chicago Symphony Orchestra’s (CSO) Hall on Friday night might resemble a piñata raining colorful, sophisticated surprises. The Symphony Center Presents Jazz Series featuring The Bad Plus with Joshua Redman perfectly embodied the fun of a child’s birthday party but with all of the class you would expect from a concert at the CSO. To say that The Bad Plus is avant-garde is an understatement. The trio—an ensemble that has released recordings ranging from Igor Stravinksy’s Rite of Spring to covers of Neil Young and Ornette Coleman—has an almost inhuman capacity for creativity. 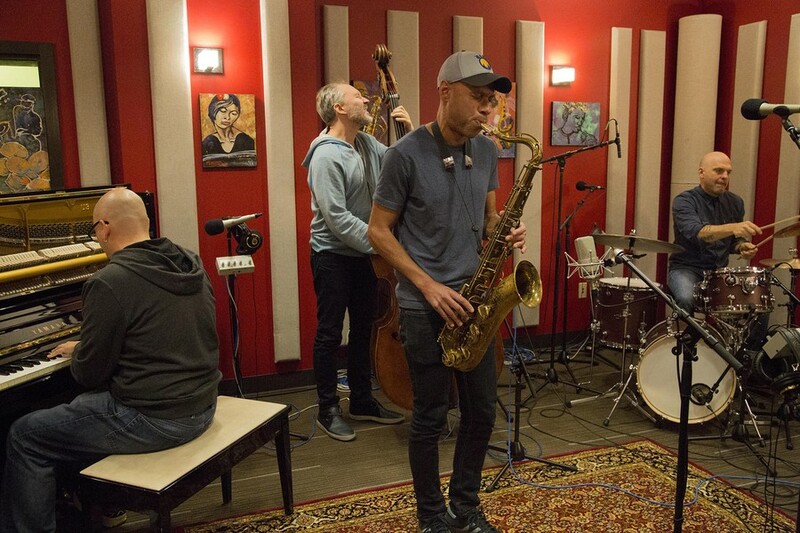 They typically perform without guests, but after a hugely successful series of Blue Note performances in New York with Joshua Redman in 2011, the group began to collaborate more with the famed saxophonist. This ultimately resulted in a well-received album that was released in the spring of 2015. To whatever forces brought the two artists together four years ago, I am forever indebted to you. Everything about Friday’s performance was fresh, tasteful, and so fiery that at the end of the performance, I actually had to remain in my seat for a few moments to collect myself. The group opened with drummer David King’s “Beauty Has it Hard,” which began with a comfortable piano melody that turned dissonant a few moments later. Surprisingly, this dissonance was easier to swallow than that of other famous jazz artists, such as Wayne Shorter, who enjoy harmonic experimentation. Never once did I feel like the compositions were purposely jarring for the sake of hurting the audience, but rather, they were very tastefully portrayed—never fussy, never overdone, always meaningful, enhancing and wonderfully surprising. By the time Redman entered on “Beauty,” he was so flawlessly integrated that he seemed like the long-lost fourth member of the group. It never felt like an uncomfortable or forced collaboration. The Bad Plus is known for its strong group mentality, and Redman, although technically the guest of honor, never seemed to outshine the other members. The ensemble’s collective energy was infectious. However, there were a few moments during the performance when the energy made King over-zealous to the point of overpowering the group. King, probably one of the most skilled and inventive jazz drummers alive today, was a pleasure to listen to because of his immense creativity and metrical variety in each tune, but it was a shame that he sometimes smothered Redman’s solos. My only other criticism is that during bassist Reid Anderson’s ballad “Lack the Faith but not the Wine,” the band seemed to lack a bit of its trademark intensity from earlier in the performance. That being said, it was a treat to hear Joshua Redman’s velvety tone soar through the acoustics of Orchestra Hall on something slower. The audience definitely needed to take a break from the thrilling roller coaster of some of the earlier compositions. I only wish the band hadn’t seemed like they needed the break as well. However, these slight shortcomings were fleeting. From the moment the ballad ended until the end of the concert, the show was so vibrant that it could have been a Red Bull commercial—and a highly enjoyable one at that. The music climaxed in a nearly pyrotechnic display of sound in the finale of “Silence is the Question,” which is also by Reid Anderson. Up until this point, Anderson had not taken any solos of his own, something conspicuously odd about the concert. Thankfully, “Silence” opened with a lengthy bass solo, giving him a chance to stretch out and show off his lustrous sound. By the end of “Silence,” the piece had evolved to such an extreme height that I was convinced that if anything could bring down the roof of Orchestra Hall, it would be this group. Redman’s final solo was outrageous, musical, and incredibly full of raw emotion. It was this moment that proved how The Bad Plus has all the ingenuity without the pretense. The entire night was dedicated to a full display of their inventive artistry, yet this brief moment showed that they, like the audience, were just there to have a good time. Sketchy vocals aside, Anderson was right about the fact that there is an abundance of things to do in Chicago; I’m just glad I chose to go to this concert. The album was 11 dollars well spent.